You could become one of the local businesses and trusts which supports Ecas. It’s a great way to get involved in the community, raise your business profile, and boost staff morale. Could you help fund activities, grants, transport or befriending services? What about exhibiting our clients’ art/crafts work in your workplace? If you’d like to join in with us, we would love to hear from you. My mum used Ecas for years. She was in a home and needed 24-hour care. She didn’t get out much so Ecas was a lifeline for her: a way for her to get out and have a bit of a life, meet new people and learn new skills. Personally, I know the difference it made to my mum. The fact that she could actually get out and do that every week is massive – you can’t put a price on that kind of service. So to me, Ecas does a brilliant job and that’s what makes them special – they’re just a little bit different. 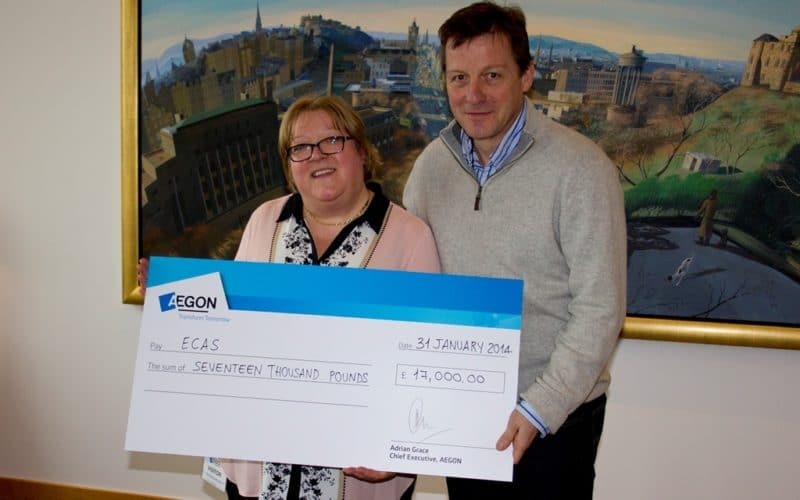 For Aegon (an Edinburgh-based company that’s been here a long time – like Ecas), it’s fantastic to get involved and support a charity that’s doing a lot in our local community. Corporate responsibility is very important to Aegon, so working with Ecas and helping it to extend its services is fantastic. When I think about the money that was raised, how it’s helped the art class with the materials they’ve got, it’s helped in many ways. It doesn’t have to be huge sums of money. It could be volunteering to help with befriending, or it could be a small thing such as lending a room to Ecas to help them with something that they want to do. Any way that you could help would be fantastic.